According to Graphic Design: The New Basics “Layers are simultaneous, overlapping components of an image or sequence.” Layers enhance an image to make it more detailed. You see layers being used in so many ways especially in a book or on a project where you use Adobe Illustrator or Photoshop. These tools help to enhance the overlapping in the image. Two examples of comics that use layers are What it is and in Powdered Milk, both use layers in different ways. An example in Powdered Milk is on the cover of the comic, with the stacking of so many presents. Since the cover and the entire comic is in black and white, you can see the details that go into drawing the 3-dimensional presents stacked on top of each other. By creating the 3D effect they are using printed layers because it is compiled to create the appearance of a seamless, singular surface. 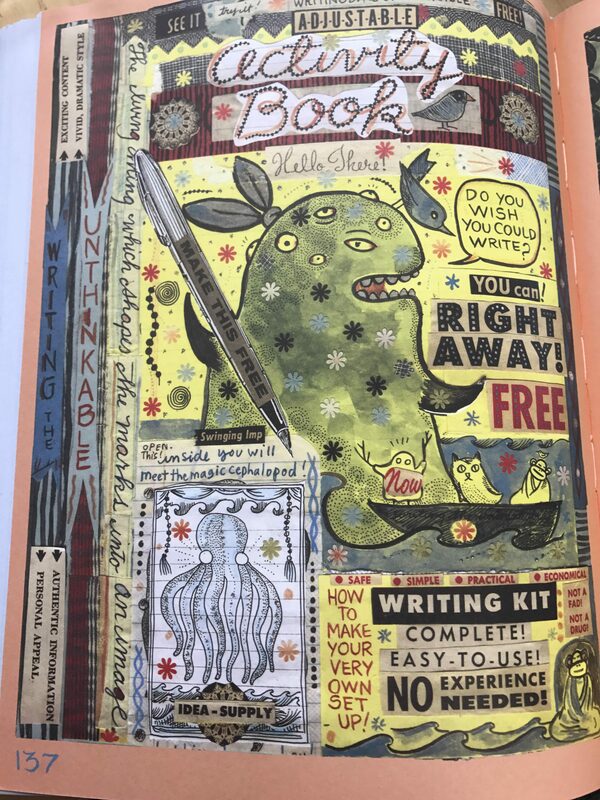 Lynda Barry uses layers throughout all of her different comic books but especially in What it is on page 137 when she is talking about creativity and the freedom you have. In this example layers are seen when Lynda Barry uses Cut and Paste to put a wide variety of images on top of one another to explain the freedom of creativity. Cut and Paste is a type of layering in that you use a software application to copy, cut, and paste a piece of the image and move it to a different part of the page or rearrange it so that it is rotated into a different position. Layers can be seen in a wide variety of ways, they are images arranged on top of another and make an image become more intrinsic.